My family vacations usually involved road trips to amusement parks, historical villages or houses of old, distant relatives who smelled like moth balls. The closest I ever got to a Caribbean vacation was the Pirates of the Caribbean ride at Disney World. Needless to say, I was beyond thrilled when I was given the opportunity to visit three of the most gorgeous islands that Wimco represents: St Barts, Anguilla and St Martin. 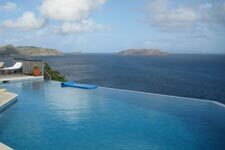 St Barts – It really does live up to the hype! Going into this trip I think I held the title as the person who knew the most about St Barts without ever having been there. I had seen every picture, forum post, and website, but absolutely nothing could have prepared me for the real thing. It's something you just have to experience for yourself. 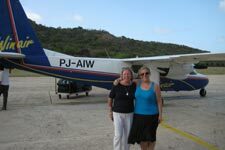 Maybe it was the baby Heineken I had at the St Martin airport, or maybe it was the intense landing on the tiniest runway of all time in St Barts – either way, by the time I got off the plane my heart was racing and I could not stop smiling. Doug, Lidy and I picked up our two rentals cars (a Terios and a Mini Cooper – so fun!) and zoomed up to our villa for the next four nights, Villa SIB FRE in Pointe Milou. SIB FRE has the most amazing views and infinity edge pool and we spent practically every minute we were at the villa sitting outside staring at the beauty in front of us. The owner's attention to detail was also truly amazing. Whenever you needed something, you just opened a drawer where you thought it might be, and it was there. The most fantastic amenity when we arrived, besides the very comfortable beds where I promptly passed out after the long trip, was having our refrigerator provisioned ahead of time. It was filled with tasty snacks from Maya's To Go – milk, eggs, cheese, mini quiches, cookies, salads and more. It was perfect after a full day of traveling and there was so much food to choose from that we stayed in our first night and just ate at the villa. Andy's Hideaway – It was just like I'd heard about. Andy himself was there greeting customers and our waiter was just as friendly and welcoming. It was a laid back atmosphere, but the food came so quickly and everyone working there was very efficient. Doug and I split a Pina pizza (ham and pineapple) and it was one of the best pizzas I ever tasted in my entire life. The small carafe of vanilla rum at the end of our meal was also a nice treat. Les Bananiers – This restaurant is next to the bakery in Colombier and has a really cute atmosphere. Our waitress was so on the ball and the service was exceptional. I had grilled sirloin with blue cheese sauce, au gratin potatoes and peas. The serving was huge and I couldn't finish the whole thing (that doesn't happen often). The prices were also quite reasonable and it was certainly a good value restaurant. 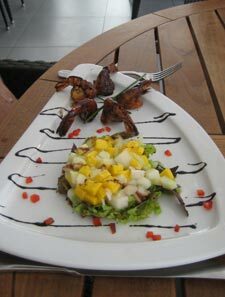 L'Isola – This is the new restaurant where O'Corner used to be in Gustavia, so we decided we should give it a try. The ambiance was nice and our server was very enthusiastic. They had only been open a week when we went, and had a few minor kinks to work out (our meals took 90 minutes), but they apologized profusely and all of our wine was free. Also, my raviolis were the most magnificent things I had ever tasted. They literally just melted in my mouth. The Beaches – Although I live in the Ocean State, I hadn't had the opportunity to get to the beach all summer. Luckily, after visiting four beaches in one day in St Barts, I more than got my fill and it was definitely worth the wait. The amazing blue-green waters looked like something out of a glossy magazine and the sun and sand were so relaxing. We went to Saline, Gouvernor, St Jean and Lorient. Each had its own special charm, but I think Saline was my favorite. It was virtually deserted, the waves weren't crashing too hard or soft and I couldn't help but pretend that this was my own personal, amazing beach.